The best part about The Winery at Bull Run (15950 Lee Highway, Centreville, Va.) is that you don't feel like you're just driving up to just a NoVa vineyard -- you're pulling up next to the historic Manassass National Battlefield Park. The winery just opened its doors in June, but the setting is pure 1860s, from the scenic countryside to the Civil War-era winemaking demos and artifacts. History aside, though, the wine is particularly intriguing, especially a delectable port-style wine called "Fort," served with chocolate. It may be a dessert wine but somehow we've ended up drinking it for every occasion and/or meal. Inside the winery you'll find a cozy fireplace with a few sofas, although the outdoor heated patio is equally welcoming on not-too-chilly winter afternoons. You'll also find a fireplace and patio at the seemingly dilapidated (but still maintained and attractive) "ruins" of the original Entwisle estate house, now called the Stone Mansion House on the grounds of the winery. Wine tastings at Bull Run are $12 and include a wine glass to add to your growing collection. 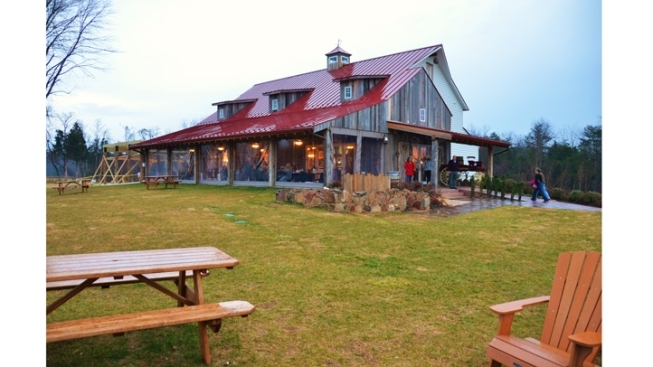 The winery is one of only two in Fairfax County. Hours are 11 a.m. to 7 p.m. daily, except on Fridays when the winery stays open until 8 p.m. The Winery at Bull Run is about 45 minutes from downtown D.C.